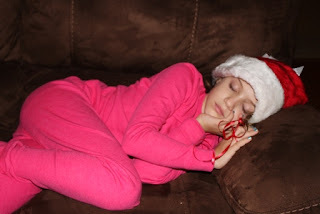 Every year, the kids want to stay up until midnight to welcome in the new year. This was Sydney at 7:30. I don't think she is going to make it. However, congratulations are in order, see the ribbon on her finger? She says she is engaged to a very nice celebrity from TV. Though there is much cleaning and packing going on around here, I wanted to spend a few minutes sewing today. These tiny little houses seemed to fit the bill nicely. There is a dime on top to give you an idea of scale, though you can take a peek at the quarter in seam allowances as well to appreciate how tiny these little fellows are. I can't decide whether I like them more or less scrappy. So far I've made all the windows yellow because it seems cheerier that way. I spent a good bit of time this morning doing prep work on more Midgets. 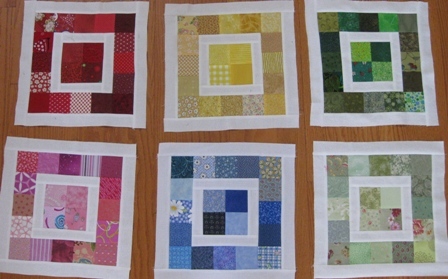 There are 10 blocks all ready to go in case of opportunities for hand work. Lots of people seem to be making a mad dash to finish off projects before the end of the year, but I've already started in on what's next. It is the last day of 2011, and conveniently, a Saturday as well. Take a few minutes to brag about your progress for the year or share schemes and plans for the new year. Do you have a project picked out for the new year? Share a link for those who are still waiting for inspiration. Ready to jump in and get started? RED is the first color of the new year. Pull out your red scraps and start sewing! For most of the day I sorted and trimmed and organized. By the end of the day I had two things. 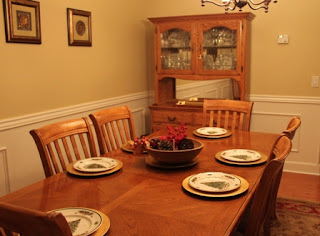 and a dining room table. This morning I got almost entirely caught up on Orca Bay. I still have a pile of blocks and parts waiting for ironing. As soon as that is done I'll count to make sure I have enough of everything. In any case, I'm ready for the new clue tomorrow. 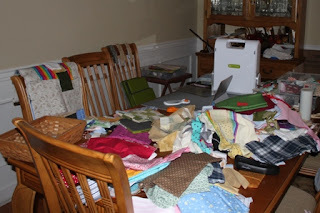 I couldn't hide away all day though, so I pulled my scrap basket out and did some sorting at the dining room table so that I could keep tabs on all the comings and goings. Then I spent most of the afternoon taming scraps. They have been piling up in a basket for a while, waiting for a little attention. I focused on squares to feed the leader and ender projects, using my GO cutter to streamline the process. I've got some tumbler blocks going as well as some more red and green bits for the double wedding ring table runner. 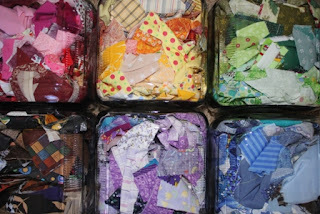 Anything too small to get cut into a nice square or strip will get sorted into a crumb jar to become part of the new Rainbow Scrap Challenge. The jars are a little emptier than they were last year, but somehow they seem to keep producing lots of fun bits for blocks. 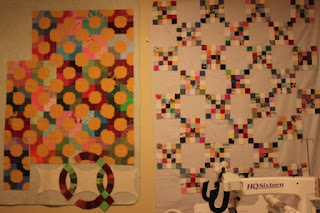 Oh, I also updated my blog margins to show the midget blocks I've been working on for a while now. I've gotten 66 done so far in about a year and half. Each of the blocks that I've completed links to a post. If nothing else, It will make it easier for me to keep track of which blocks are done. Today were are all being vegetables, chilling around the house and enjoying every minute of being home again. 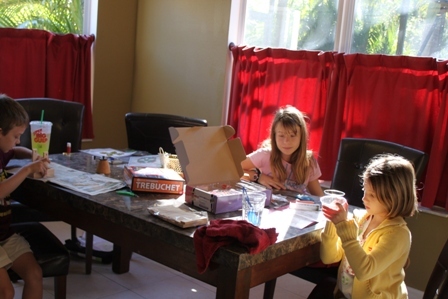 The kids pulled out Christmas crafts and construction projects and set up camp around the kitchen table. Wanting to be social, I pulled out some midget blocks to prep and joined in the fun. Here is Sydney making perfume, Ryan building a trebuchet and Anna constructing a soda can robot. Ahhh.....vacation! I took the four square quilt on our Christmas trip for binding purposes. It was going to be for charity, but Mom really liked it, so I left it for her to use. That left midget blocks for the way home. I finished three midget blocks in the car, though posting pictures to my blog exceeded the capabilities of my phone. We are finally home though and I wanted to fix the botched post before collapsing into my own bed for a nice change. I tend to get a lot of handwork done on long car trips and had used up all of the "official" Midget Blocks suitable for applique. 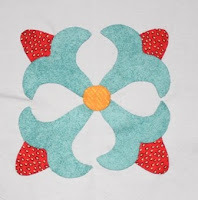 Sentimental Stitches has a set of applique blocks available for purchase though, so I did a digital download of those to keep me busy on trips. This one is called Diamond Star. It is supposed to have embroidery between the diamonds, but I might leave it as is. Next up is Rose of Sharon. 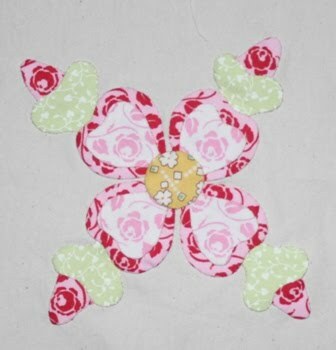 Notice the rose fabric that I found? It was in a stack of red I dug out for the scraphappy giveaway. The last one had some silly name like flower number 7. I think I will call it Trumpet Flower instead, I am fond of the red fabric here, I think it looks like seeds. 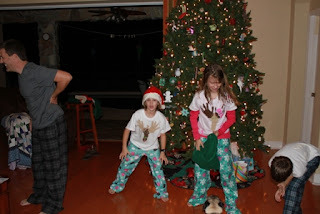 We tried to take a nice family photo of the kids in the Christmas PJs they made. 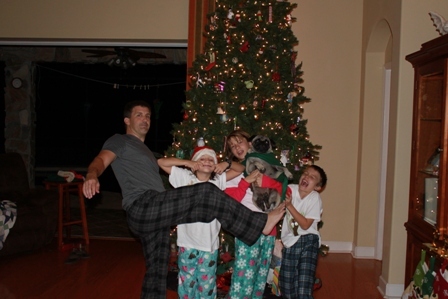 That was followed by the silly picture. Which was apparently followed by minor back injury. 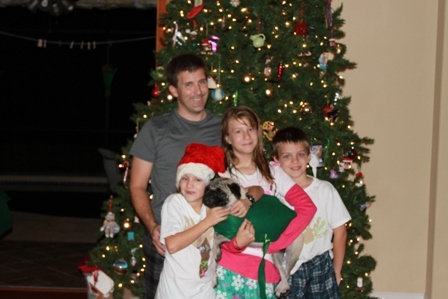 I hope you all have a wonderful Christmas this year with your family and friends. There are only 2 more Saturdays left in 2011. I know I am already full of plans and schemes for 2012, but until then, I hope you will all take a few minutes to brag about all you have accomplished this year. 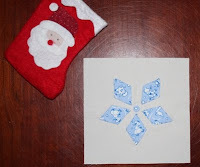 Use the linky below to take us to a post showing off your scrap creations for the year. Welcome to the Rainbow Scrap Challenge for 2012. After a year full of scraps in all the colors of the rainbow in 2011, we are back, brighter and scrapier than ever. The idea of the Rainbow Scrap Challenge is simple. Each month a new color will be chosen. You just need to dig out some scraps in that color and make something -- anything. Some people made full quilts last year, others pulled out old UFOs. Some of us made individual blocks that got combined at the end. The choice is entirely yours. Each Satruday a Scraphappy link up will be posted so that you can see what everyone else is up to and collect some new scrap busting ideas. No need to sign up, no reason to feel bad if life gets in the way and you miss a month along the way. No quilt guilt allowed. Just pop in on the weekend and check out everyone's progress, go visit and offer some encouragement. Feel free to grab my button and post it on your blog. You should be able to just copy the HTML code in the box under the picture and paste it into a new gadget on your blog. Please let me know if you have any issues. It is the first button I've done since last year at this time. It isn't at all like riding a bike, but I found a code generator here that seemed to do the trick. We will be posting a Rainbow Wrap Up this Saturday and a Final ScrapHappy Saturday post on January 31st. Drop by to see the great projects everyone has created and to steal some ideas for next year. Until then, here are a few projects I've been considering for the new year. I hope it gets your creative juices flowing. 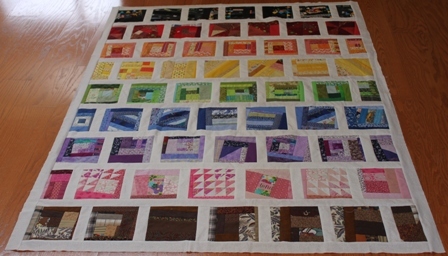 A log cabin or pineapple quilt in all the colors of the rainbow. String blocks, a classic choice, either in 3.5 inch or 6.5 inch sizes, here is one with selvages. A tiny nine patch quilt. A not so tiny one would work too. 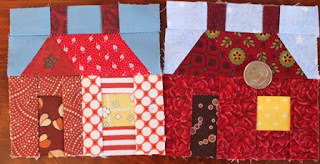 Tiny Scrap Houses. Too cute for words. Or this bigger version. Just crumbs, but in rainbow colors they take on a modern flavor. Or maybe some crumb hearts, crumb stars or crumb geese. Rainbow Blocks in a tangled windows setting. Here is another version in black. Ticker Tape blocks, check out these place-mats. Finally, check out this rainbow inspiration post by Jessica. how exciting-not sure i can pick just one color-maybe red since I haven't started my red strings yet for Orca Bay...Congrats on 1000 posts! That sounds perfect to me. 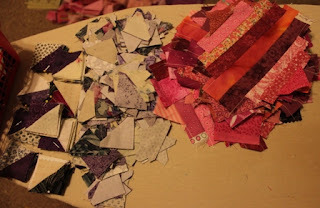 I'm using pink for my quilt and would love to gather up some red to send away. I've got a little stack of red squares ready to go for step 6 and I'll see what I can find for the strings needed in step 4. I was running low on purple and did a little stash enhancement while finishing up some shopping last night. Seriously, how cute it that? Kathy left a comment earlier about how she was participating in a new challenge for 2012. It is called building houses from scraps and you can read more about it here. 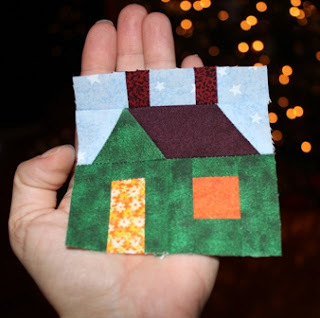 There are over 1000 people signed up to make a 3 inch house block for each day of 2012. 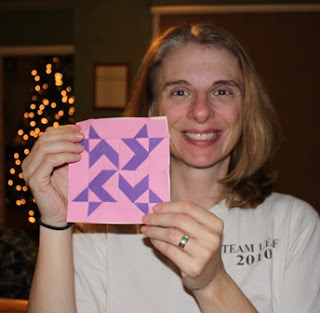 I followed a link and Jantine at Urban Style was kind enough to e-mail me a paper piecing pattern. 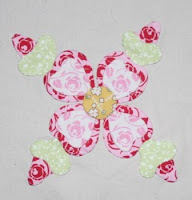 This one would be really cute to do in conjunction with the rainbow scrap challenge. How cute would it be to have rows of little houses in all of the colors of the rainbow? Having said that, I don't think I'm quite crazy enough to commit to making 365 of these little fellows, but I might whip up a few for fun. I'm still trying to decide on the perfect month to month block for my own Rainbow. My favorite projects this year were the ones that had collections of a single block done in all of the colors of the rainbow. It has been absolutely ages since I've done a Tiny Tuesday. Have I mentioned lately that I love vacation? This one is called Whirling Pinwheels. It is block number 52 and is paper pieced in 40 pieces. 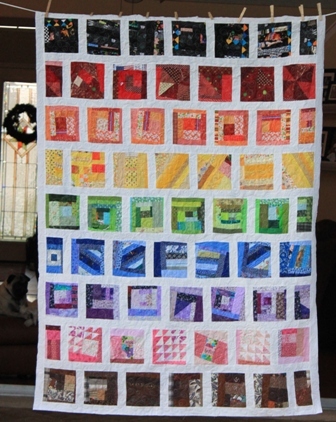 First, a big thanks to all the participants who have sewn along with the Rainbow Scrap Challenge this year. Some people joined at the beginning, some joined at the end, and some sewed off and on all year long. 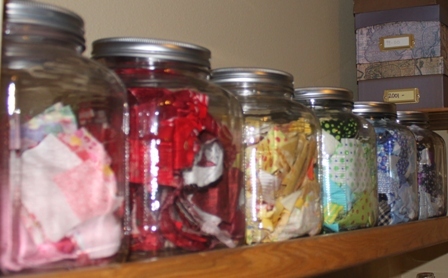 The only real goal of the challenge was to use more scraps by focusing on one assigned color each month. 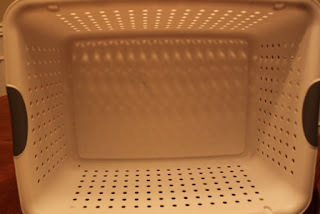 Each Saturday I posted a linky box for anyone who had worked on a scrap project during the week to share their progress. Some of us started out with grand ambitions and finished off an entire quilt from time to time, some had more reasonable goals and pulled out a UFO or made a single block or small project featuring the assigned color. On Saturday I'll post the last link up of the year so that everyone can show off all the great Rainbow Scrap Projects they have created this year. At the same time, I'll post a new challenge for 2012 based on the same idea, but with a few changes based on lessons learned during the current challenge. So, if you've got some great Rainbow creations from the year, start thinking about putting together a post to brag about your accomplishments. A nice collage or collection of pictures is the perfect way to wrap-up and reflect. I woke up bright and early Sunday motivated to sew the binding on both of the quilts finished up Saturday. 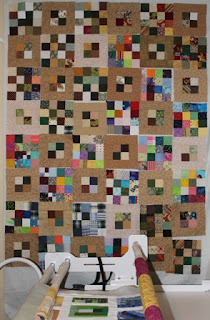 Pulling down all the four square blocks left a big open space on the wall, leaving me wondering what to work on next. I seem to be on a leader and ender marathon these days and so pulled out these Irish Chain blocks that are my 2 inch sized lne project. I'll do some quick calculations to figure out how many more I need before starting on the alternate blocks. 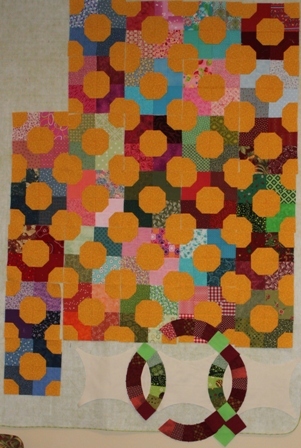 Head over to Patchworktimes to see what other people have up on their design walls today. Two finishes left me with a bit of cleaning up to take care of, but after that I worked diligently on Orca Bay for most of the afternoon until I got called away to take the girls Christmas caroling. The 350 HST triangle units are sewn and dog eared while a nice stack of string blocks is starting to pile up. I've got a system going now. Each time I go to iron a set of strings, I work another group of 10 little squares through the iron and pin them together. 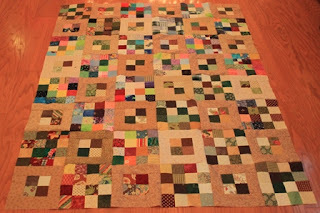 I think by the time all the string blocks are done the other blocks will be ready to have little triangles added on for step 5. I know that I am still a little bit behind, but with just two more school days before the holiday I should be able to catch up very soon. Maybe even by Wednesday when I have my 1000th post giveaway drawing. Hopefully maybe. Until then, head over to Quiltville to see how far everyone else has gotten on Orca Bay. My finishing up never happens on Friday. Or rather, the finishing up on Friday is always work related. It was a calm day at home though, allowing plenty of time to stream holiday movies on Netflix while quilting up a storm. First up is a less wonky photo of Rainbow Crumb Parade. This one makes me smile because I can remember where all the little bits came from. See the tiny pink triangles? Those are from Mom's Chemo Quilt. And the purple, they were leftover from Lilac Potpourri, which was leftover from Anna's Purple Beauty. Crumb quilting is such a nice way to revisit the ghosts of quilts past. 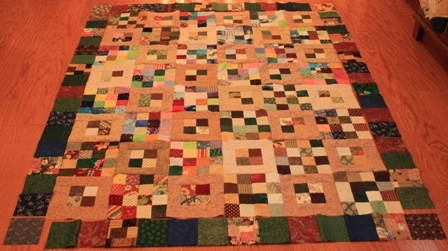 Next up is the four square quilt which I got quilted today. Kurt voted strongly NOT to have another border, so I left it at one and got it all loaded lickety split this morning. 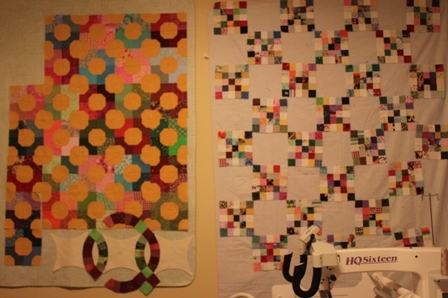 Both quilts are still in need of binding, so that might be on the agenda for tomorrow. 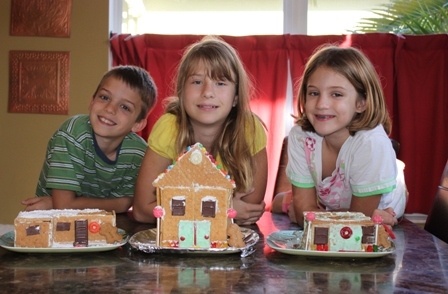 The only other thing we accomplished today was gingerbread houses. Sydney wanted to make them out of real gingerbread until she started reading the recipe. Then we all voted to go with good old fashioned ready made graham crackers instead. I just updated my margins and am excited to see that the WIP list on the right is down from 17 to 14 and the Finished list on the left is up to 27 for the year. ScrapHappy Saturday and a Giveaway! It is my 1000th post! 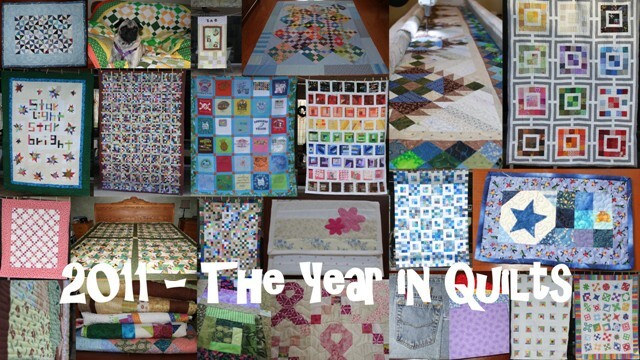 Who would have thought there was so much to say about quilting? In honor of this momentous occasion, I am having a giveaway! Based on the rainbow idea, it is a "you choose a color" giveaway. Pick a color, any color. 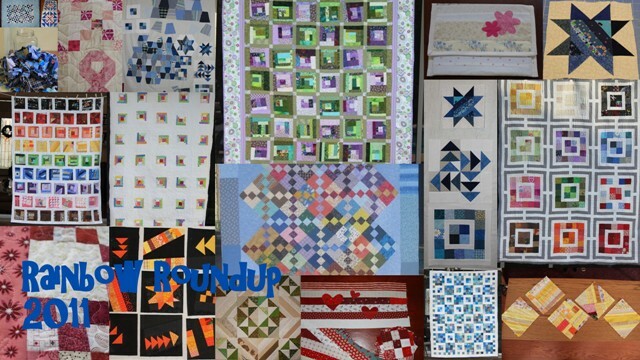 Your favorite, one you don't have much of, one you want to use in your next quilt. A primary color, a secondary color, whatever color you can name. I'll search through my strips and squares and into my stash to put together a surprise bundle in that color. Just leave me the name of a color as a comment, I'll choose a winner next Wednesday when school breaks for the holidays. Until then, how are you doing on the Rainbow Scrap Challenge? We seem to be losing a little steam at the end of the year, making me think that next years challenge will be a 10 month challenge allowing time to tie up the loose ends at the end of the year. For those of us still working away, post a link to your projects below. I let my top sit in the middle of the family room floor so that I could ponder what to do next. Eventually I went and pulled out the 4.5 inch square drawer and dug for the darkish squares. I think I'll sew these on and then finish with a band of nice chocolate brown. I wonder if I have any nice chocolate brown? Maybe I'll have to pop out to find some tomorrow. The nice thing about having relatively small stash is that I never experience quilt guilt when I need to shop a bit, especially when I need something to finish a project. This one has been hanging out on the design wall for a while now. 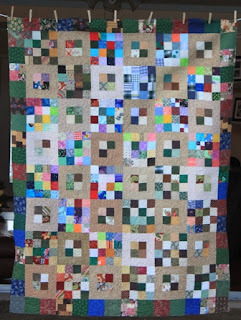 It is another version of the same four squared quilt that I've made several times in the past, but this time with brown alternate squares from the November Rainbow Scrap Challenge. It seems on the small side, I've got the measurements written down somewhere for the standard donation size that I usually make.... There are still lots more leader and ender blocks I can add in there to make it bigger. The nice thing about leader and ender blocks is that they never end, finishing one project is always the beginning of something else. We had a long discussion in one of my classes this week about whether there was a connection between the infinity symbol and a mobius strip. It turns out there isn't, but it still got me thinking about things that don't end. Too bad weekends aren't on that list. It has been a busy week, and I was SO looking forward to having a weekend to FINALLY get back into the sewing room again. 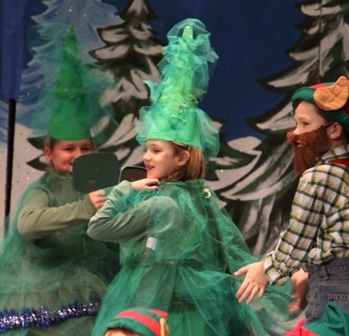 Right before the holiday break is always a super busy time at school. Our semester ends and that means midterms are in full swing while grades are being finalized. 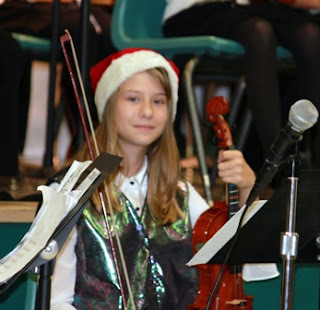 My own kids are booked solid with parties and field trips and of course concerts and plays. I can't even remember when I got stuck on Rainbow Crumb Parade and left it abandoned and sadly listing on the frame. I was just inches short on backing fabric and had to work out a way to get some added on without entirely pulling it off the frame. 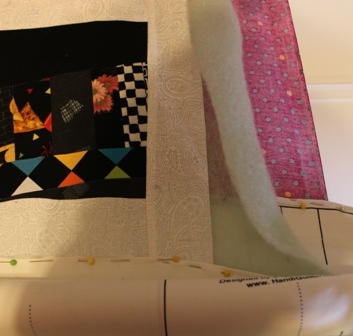 Eventually I decided to just unpin the bottom and move the machine over to sew on an extra strip. I'm so glad I splurged on the extra wide ironing board. It isn't perfect, but at least it is done. Orca bay is next on the list. I'm two and half steps behind now. I wonder how much catching up I can get done in one weekend? Still trying to wrap things up around here, I've managed to resist the urge to start lots of new Christmas projects so far. How about you? 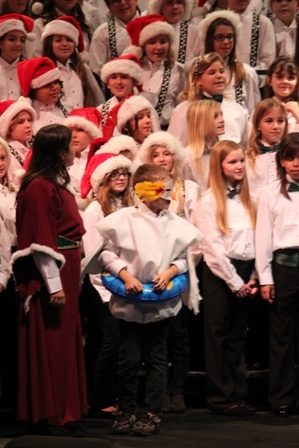 There are nine more days of school before break and four of those are for exams. I've got lots of good stuff swirling around for after that, but for now at home and at work it is all about finishing off. I was at training today instead of at school. It is amazing what a small change in routine can do for your outlook and attitude. I went in this weekend to work on sub plans, and though I'm sure I'll regret it later, I decided to spend a little bit of time before leaving for Academic Team tonight finishing up the quilting on my rainbow crumbs. 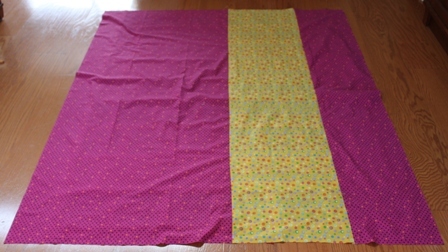 Things were going along well enough until I rolled down to the last little bit and realized that the bottom of the quilt is about three inches longer than the bottom of the backing fabric. I checked before I loaded it on the frame. I guess the top was just super stretch compared to the back? There are a lot of seams in those crumb blocks. What to do, what to do? I guess I'll have to unload it, sew some more fabric on the end and then either reload it or quilt it on the regular machine? I guess that is a problem for another day. I know it will bug me all day tomorrow if I don't do something about it though. Mabye I should just quilt up to the red row and chop the black off the bottom, seems like a waste, but it could work. Ahhhh, lesson learned, much better to have too much fabric instead of too little on the back. It was a weekend of little bits of lots of things. I did manage to finish piecing all of the blocks for the Four Square Brown quilt. I'm not crazy about the light colored blocks, but maybe they will grow on me? I'll get that webbed together soon and make some decisions about borders. Rainbow Crumb Bricks is on the frame. It is about half done so far. 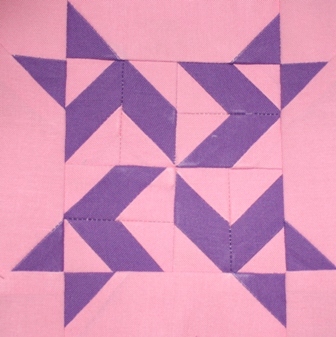 The quilting pattern is called double bubble and it goes pretty quick. I got just a few more Bow-Tie blocks put together and spent some time playing with my new Double Wedding Ring die. If I keep practicing, I am sure I will master curved set in seams. 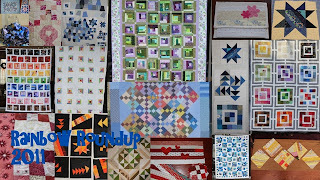 Pop over to Judy's Blog to see what is on everyone's design wall this Monday. In between all of that I worked on Orca Bay step three. All the units are cut out, and it looks like about 50 of them have gotten finished up so far. The rest are waiting patiently by the machine until I have time to get back to them again. I'm not at all sure how these bits are going to fit together in the end, but I have faith that they will. Can't wait to break out the hot pink, I think it will perk things up. 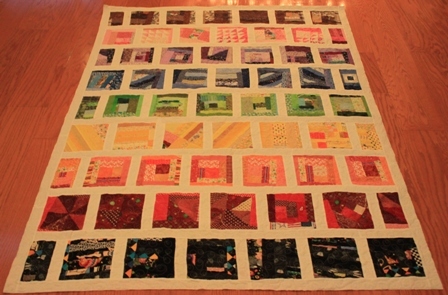 Be sure to visit Bonnie's Blog to see the progress other people are making on their Orca Bay mystery quilts. I wasn't quite sure what I wanted to work on today. A couple of things I've ordered recently have started coming in, leaving me wanting to try them all out at the same time. I've always wanted to make a Double Wedding Ring Quilt, and thought it might be easier with a die to cut the pieces. I'm calling that my Christmas present to me, and it came on Friday along with a 2.5 inch square die. So I spent some time playing around with that yesterday until I ran out of the right pieces. I might cut some more tonight to make enough for a small table runner or wall hanging type quilt in Christmas colors. Then this piece of fabric came in from Spoonflower. I don't remember where I saw the link, but someone had made a periodic table quilt and I thought it would be cool to hang in my classroom. I didn't start on that though, maybe it would be a good project for Winter Break? I started in on step 3 of Orca Bay of course. Most of the half square triangles are cut out and some have started to work through as I was trying to finish off other things. I'm just about done with the brown four square, I've just got a few more blocks to finish up. I prepped some more bow-tie blocks to the collection, but not much has happened since then. After all of that hopping around though, I thought it would be nice to actually finish something. So out came the rainbow crumb parade that has been draped patiently on the frame, waiting for me to feel like quilting again. I had picked out some backing fabric already, so that got put together while Kurt took the kids to see the Muppet Movie this morning. He hardly ever volunteers to see movies, so I was happy to let him go. He was out of town at training all week, so the kids were glad to have some time with him, and I was thrilled to let him. Despite a fair amount of time in the sewing room today, I haven't got a single finished step to show. Crumbs are about half done, squares are almost there, DWR is just a suggestion of a quilt and Orca Bay #3 is still just triangles. I think I'll spend about an hour and see what I can accomplish before cleaning it up for the week. Tomorrow is the BIG district competition for Academic Team, I've got training on Monday and Tuesday, there are exams to write and papers to grade......I'm guessing not much will happen during the week. Winter break is coming up soon though, and I am thinking already about the sewing I'll get done. 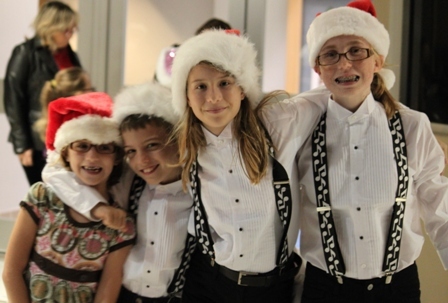 How about you, feeling the need to keep crossing projects off the list, or ready to spread some Christmas cheer? Use the linky below to share you ideas and progress so far.